Did you know that Ypres (Ieper) was as powerful as city in the old county of Flanders as Bruges (Brugge) and Ghent (Gent)? The Hall Tower and the Cloth Hall bear witness to the wealth of the years 1200 - 1300. Ypres used to be a very important center for the cloth industry. The Cloth Hall served as a covered sales and storage place for cloth, woven mostly with wool imported from England and Scotland. Today the building is occupied by the 'In Flanders Fields museum' which more than deserves your visit. During the First World War, the Cloth Hall was almost totally destroyed. The Cloth Hall with its 132m of façace length is one of the major gothic civil constructions of the middle ages in Western Europe. Above it thrones the Hall Tower. The building is a powerful illustration of the wealth and self consciousness of the medieval citizen. From 2012 on, it will be possible to climb the Hall Tower. 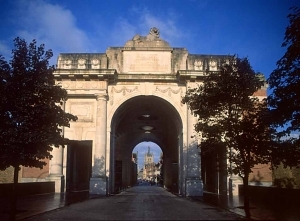 Entering Ypres (Ieper) through the Menin Gate (Menenpoort), built by Sir Reginald Blomfield. 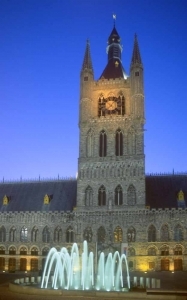 Since 1928 every evening at eight o'clock sharp, buglars play here the Last Post to honour the memory of the soldiers who fought and died in the Ypres Salient. 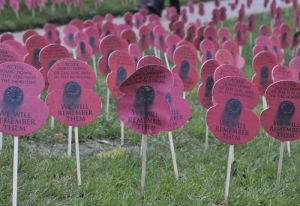 Ypres and the Salient have been heavily marked with the horror of World War I. November.11 is Remembrance Day. The Poppy Parade marches from St. George's Memorial Church to the Menin Gate, as poppies became the symbol for the war at the Western Front and in the Ypres Salient.